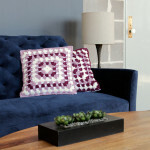 Like many crafters, I learned my hand making skills from family members. She’s come up on this blog before, but one of my foremost crafty forebears was Great-Grandma Louise, who lived to age 102 and crafted nearly to the end. My mom was one of her 20 grandchildren, and the crochet poodle that led me down a rabbit hole (and eventually to this post) is one of her many creations. My mom, along with her sisters, each received a bottle of nail polish in differently colored, crocheted poodle outfits. Why? Because crafting in the 1960s was all kinds of amazing. A phone chat with Mom confirmed that this aqua creation had to have been made between my mother’s birthdate and 1967 due to a family move from Iowa to Minnesota that year. For me, a nerdy librarian, getting to research the nail polish bottle this poodle was crafted around was almost as awesome as getting to have this handmade heirloom in the first place. This research also helped narrow the time frame this might have been made in. 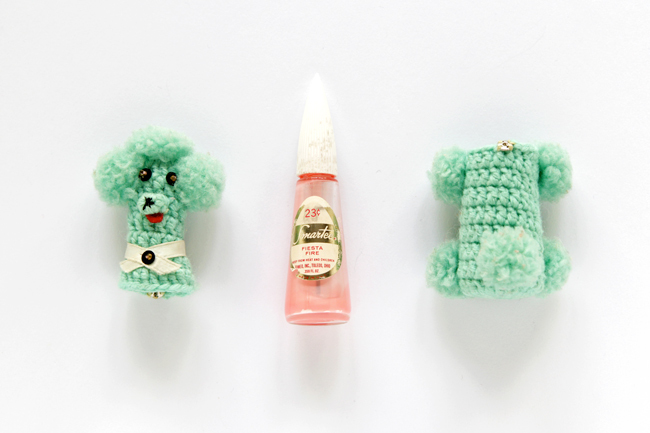 The nail polish within the poodle cost only 23 cents, featured a pink polish (or at least it looks pink now!) 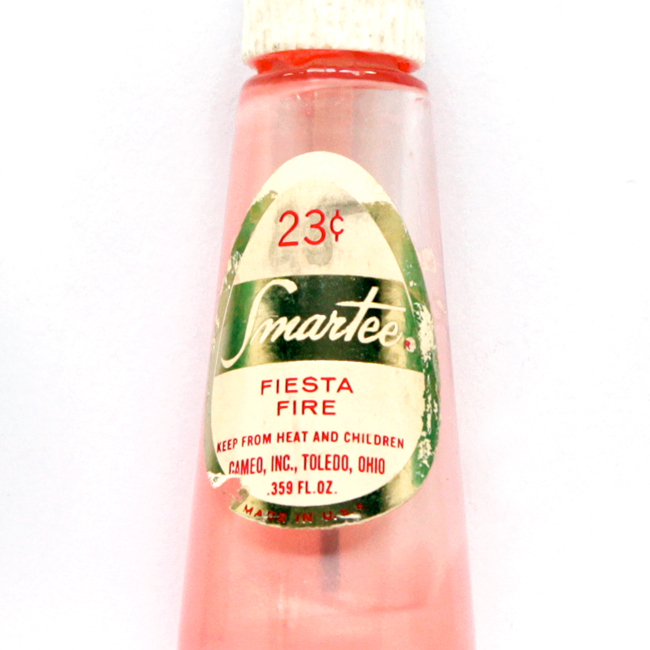 called Fiesta Fire, and the brand of the polish is Smartee. A quick google of “smartee nail polish” (and you obvs don’t have to be a librarian to think to search for that!) led me to the Canadian Intellectual Property Office’s website. There’s a page on the CIPO site for the Smartee trademark, claiming that it was registered in 1964, but the page says that the name Smartee may have been used as early as 1952. 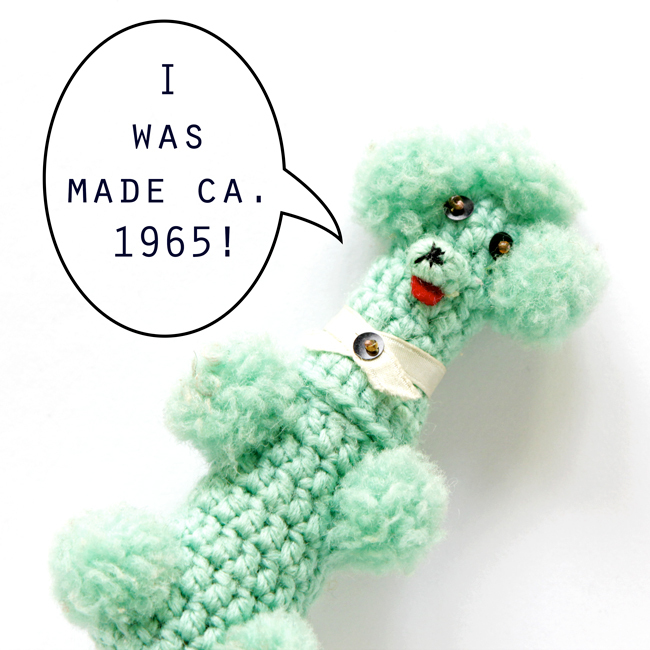 Based on this and my mom’s info, I think mr. nail polish poodle was likely made between 1964 and 1967. As far as I can tell Cameo, Inc., the company who manufactured this nail polish, is a still-operating company in the Toledo area. Assuming I’m right (since they don’t seem to have a website to confirm this), they are a contract packager of goods, including toiletries, to this day. And where do I get this assumption? This directory entry from Packaging Digest, of course. In case you were wondering, Packaging Digest seems to be a huge packaging industry publication. A really cool gift idea / how to make a nail polish poodle! With the holidays coming up, this 50-year-old idea from my Great-Grandma is so perfect if you’re looking for a quick handmade gift. Looking at this poodle (and having a good familiarity with my grandma’s other self-designed work), I can see a lot of double crochet stitches and an increase here or there. 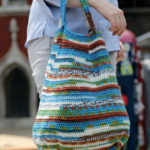 I have no idea what yarn she used, but I’m pretty sure based on the early 1960’s time frame and the look and feel of the yarn, my guess is it’s some kind of mass market acrylic. And looking at the size of the stitches, it’s probably an F or G hook. What it looks like Great-Grandma did was buy the nail polish and size the poodle cover to it. 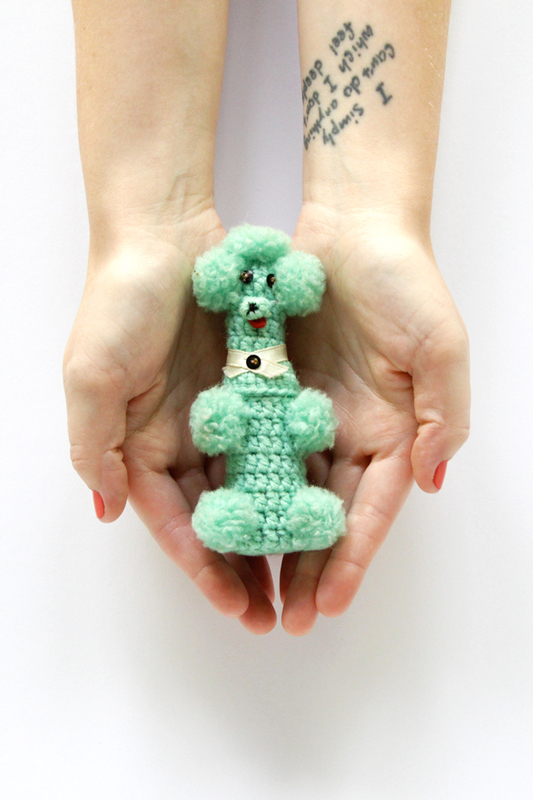 If you know how to crochet a circle, you can crochet a nail polish poodle! Please note that even though my Great Grandma made this, the pattern is the intellectual property of this blog. Please don’t steal my patterns, it’s been happening a lot lately, and not in awesome and fun fair use ways. If you’ve ever got a question for me about this, please email me – I’m happy to chat! 1. Make a foundation row with 10 sts using the magic ring method. 1. Make a tight foundation round with 12 sts using the magic ring method. 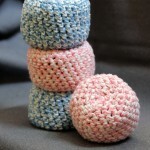 Make eight 1/2″ pom poms. Sew one where you’d like the poodle’s tail to be, and one for each of the poodle’s 4 legs. Sew one to the tip top of your poodle’s head, with the last two alongside for ears. In the center of where your poodle’s face will be, sc 4 tight stitches to form the dog’s muzzle. Sew on a tiny felt tongue under the muzzle. Using one sequin and one seed bead per eye, sew eyes on your poodle. Just like with the eyes, use one sequin and seed bead to attach a collar to your poodle. To add some definition to your poodle’s nose, sew some stitches to the end of its muzzle. Attach the snap closure to the two halves of the poodle so they line up. Slip the poodle over your nail polish, and you’re good to go! If you’re unsure where to sew what, refer to the photos throughout this post for a guide, and this GIF should help you see where all of the add-ons are placed. Of course, this pattern was designed to fit a bottle of nail polish that hasn’t been manufuactured in decades (in 1995, the company even let their trademark on the Smartee brand name lapse). So this pattern should be thought of mostly as a guide for how to DIY a pattern to fit modern nail polishes. Thank you for making my day. My grandmother was also super-crafty and made all her own sewing & crochet patterns. I remember crochet bottle-poodles from my youth (born ’64) but never saw one this tiny. Oh man! Your grandma sounds like she was way cool! Cindy, I had the same idea! I just made one sized for a nip bottle and he’s adorable. Another idea is maybe make them to cover small hand sanitizer bottles? Oh I like that! And maybe include a loop and button for hooking it to a purse? A hand sanitizer cozy would probably be a gift that more people could use, but I still think I need to make at least one for the nip bottle in memory of my Gramma (she was definitely a character). I could hang it as an ornament to remind me of her :) Thanks again for sharing your pattern! My grandmother made these poodles, in a bigger size, for her 7 daughters! She made them to fit a bottle about the size of a tall soda bottle or perhaps it was a wine bottle. I haven’t seen the poodle in years and years, so not sure about the bottle size. I have never seen a pattern for anything like it before now! I will be trying this out soon. 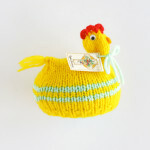 Love your blog so very much and I am doing your beginner knitting class here on the blog. You are a very talented girl! Hope you have a terrific evening! At 60 I finally restarted crocheting again which I had stopped doing when I had my kids. Now I am enjoying the leisure time I have to do it in. I remember seeing the big bottle poodles in my teen years and always wanted to do one but never got around to it then. I was glad when I stumbled on your blog and found your nail polish idea. My 10 yr. old grand daughter will love this idea. I’m trying to get her interested in trying to learn to crochet by tempting her with fun things to make and this definitely falls into the cool category. This is adorable. Thanks for sharing. Being a granma I think I’ll try a few of these for gifts too. I hope and pray I’ll still be knitting and crocheting forever too. I needed hand reconstructive surgery and am recovering from it yet. The first thing I ask was if I would still be able to crochet and knit if they did the procedure. I was told yes but some women I’ve talked to since haven’t been able to do their crafts because they have more pain, so sad. I’m hoping that I’ll figure out some inventive ways of being able to continue crocheting and knitting. I’m sorry, I’m rambling but when I saw this it brought back many memories of my youth. Thanks a bunch Sweetie. Thank you so much for sharing this cute little pattern. I have made a large one for a hair spray can. I am going to make this one for me to put in my travel bag. By the way, I so enjoy your newsletters, thank you. I love it! Do you have any photos?